Why so blue? 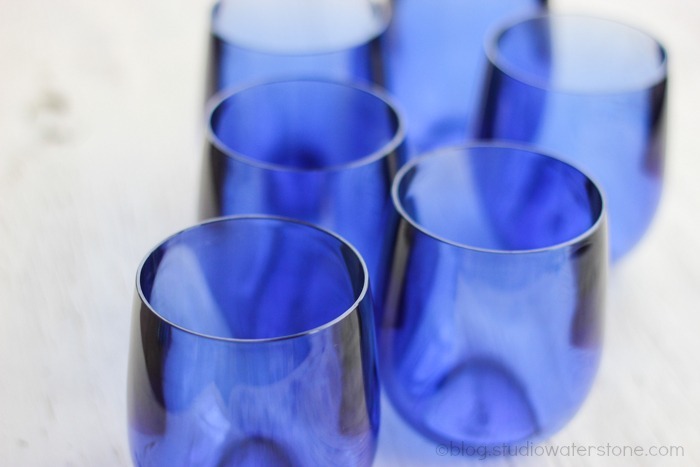 Because of these cobalt wine glasses I snatched up at a local consignment shop. Aren't they pretty? Lately, Jeff and I are like harried little squirrels, running around, hunting and gathering items for the mountain cabin, which I'm happy to report has passed all of the tests and will most definitely be ours around the middle of the month. So, because this is what we do, we're furnishing it with consignment and Craig's List items - for the most part as a trip to Ikea and Anthropologie are definitely on the wish list. Ikea because it has awesomely affordable items and Anthro, well, because it's Anthro and that's where one goes to drool. Today is my birthday. And I got a nasty germ as an early gift. So germy am I that last night I recorded Downton Abbey because it was after nine, I felt like someone had hit me with a big stick and my nose hurt. I will watch it today, snuggled up with a blanket and a warm cup of russian tea - very apropos, don't you think? Before that happens, I'll head back to my studio. Study the situation and continue to clean, organize and plan (and sneak some chocolate to celebrate the day). 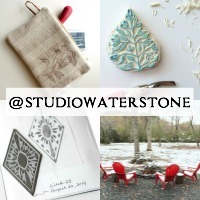 Psst...Today is that last day to save 20% on everything in my shop. Head over for a look see. I ventured into my studio yesterday and did what you suggested - tiny bites. I spent about an hour throwing stuff into three large bins that will need to be sorted later but at least I can begin to see a change! I love cobalt blue. I used to have a variety of vintage bottles on a shelf in my kitchen window that were all cobalt and were just beautiful when then sun shined through them. Lots of people sick here too, but so far, I have been spared. I sure hope you are feeling better soon, Lori. Congratulations on your mountain cabin passing all the tests. We went through this just a few years ago, when we converted an old barn into House #2. The furnishing it was fun, but the testing stuff was not so much fun. Hope you feel better soon! Lots of rest as it sounds like you have been and will be busy - with fun adventures at least! Happy Birthday, Lori! You will survive! Love the glasses! Sorry you are sicky.... But Happy Birthday! You share your special day with my mother, who is also sick. Guess you guys had too much fun this holiday season! Hope you heal up soon! So glad your cabin will become officially yours soon!!!! Sorry you are so sick on your BIRTHDAY! :(. Hoping you feel better soon! Happy organizing! Love those glasses, btw! Happy Birthday and feel well soon. Very exciting about the cabin! So sorry you're sick. We were all sick over Christmas...not fun. Have fun hunting and gathering and Happy Birthday! !